Sweating away at the gym doesn’t give you the liberty to head out to the nearest Mc Donalds for a meal. Agreed that post exercise, the body automatically sends a signal to the brain that it’s starving; doesn’t mean you fill it up with the wrong kind of foods. It’s a good idea to eat a nutritious meal post-workout to replenish the body. Get to know the importance of pre- and post-workout meals here. 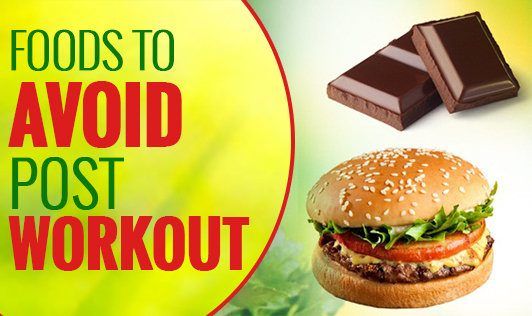 Below are some of the foods which need to be avoided post workout. Say No to Raw Vegetables: This obviously comes as a shocker since we have read about the many benefits of consuming raw vegetables. But there’s also a saying “There’s always a right time for everything”. Raw vegetables are a source of negligible calories and if consumed alone, it is not enough to restock our energy and build up our metabolic rate. Instead, have it along with a healthy dip made of hung curd or hummus or nut butters. Say No to Sugary Drinks and Colas: You may be longing for a sip of a cold beverage, but don’t pick up a Coke or a Pepsi bottle; not even a sugary sports drink! Sugar is known to encourage a sluggish metabolism which may be a dampener for anyone trying to lose weight. Consume a sports drink only after an intense workout under the supervision of a nutritionist. Otherwise, the best option is to drink lots of water and consume a potassium-rich food like banana. Say No to Chocolates: The reason is the same as explained under the last head. Chocolate is also a source of sugar and more importantly, rich in calories which slows down the metabolism. You may instead opt for dark chocolate which has 70% cocoa, thereby making it a good source of antioxidants and its anti-inflammatory properties help fight free radicals and help the body recover from the intense workout session. Say No to Fatty Snacks: A perfect post-workout meal should have a healthy dose of carbohydrate and protein. Grabbing a pizza or a plate of French fries is only going to negate the effect of your workout since it has a high fat content as compared to carbohydrate and protein. Say No to Salty Snacks: Sweating does lead to loss of minerals from our body. But replenishing our sodium stores should be the least of our concerns. Downing your body with salty snacks will lead to a dip in the potassium levels which is more essential for the post-recovery phase. So, all you exercise lovers, request for an appointment with your dietitian today for the perfect post-workout meal.